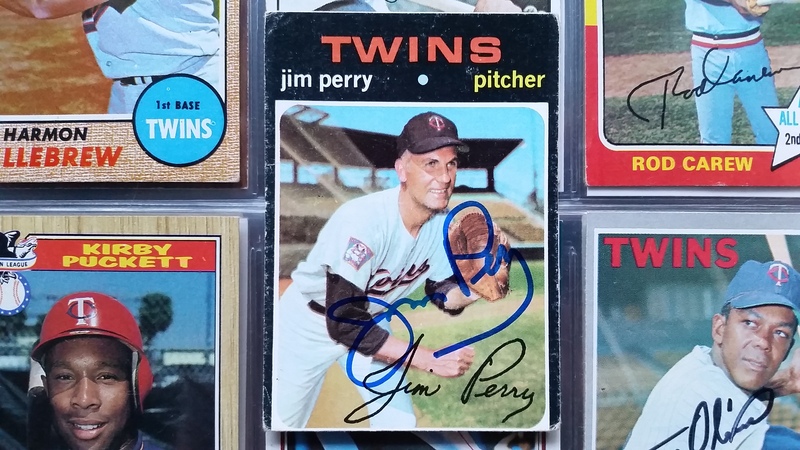 It’s the birthday of Twins all-time great Jim Perry, born in Williamston, North Carolina in 1935. Perry came up with the Cleveland ballclub in 1959 at the age of 23, finishing runner-up to Washington’s Bob Allison in American League Rookie of the Year balloting. His sophomore season he tied with Baltimore’s Chuck Estrada for the AL lead with 18 wins. He made his first All-Star team in 1961. The Twins acquired Perry from Cleveland on May 2, 1963 for Jack Kralick, who had pitched the first no-hitter in Twins history the previous season on August 26. Perry was used as both a starter and a reliever during his first five seasons in Minnesota, including the ninth inning of Game 7 of the 1965 World Series. He started 36 of the 46 games he appeared in in 1969, winning 20 as the Twins won the AL West pennant. Perry won two games vs. the Seattle Pilots on July 20, 1969. He won a game suspended the previous day in the 17th inning, and then pitched a complete-game shutout in the regularly scheduled contest. Perry won the Cy Young Award in 1970, his first season in Minnesota in which he was used exclusively as a starter, tying Baltimore’s Mike Cuellar and Dave McNally for the major league lead with 24 wins. The Orioles, incidentally, swept the Twins in the best-of-five American League Championship Series. Perry made his second and third All-Star teams in 1970 and ‘71. The 37-year-old pitcher okayed a trade to Detroit on March 27, 1973. The Twins received pitcher Danny Fife and cash money. Perry is fifth in Twins history in both wins (128) and innings pitched (1,883.1). He became the sixteenth member of the Twins Hall of Fame in 2011. Jim Perry hit five home runs in his career, one of which came while pitching a shutout at Yankee Stadium on April 13, 1968. Jim Kaat also homered while pitching shutouts on July 24, 1963, and October 1, 1970.